"He came towards me and said, which country are you from? Are you here illegally? ... "
"My husband is lying there dead...We came here with so many dreams. ​He personally wanted to do so much for this country. He studied here, he made so many friends." 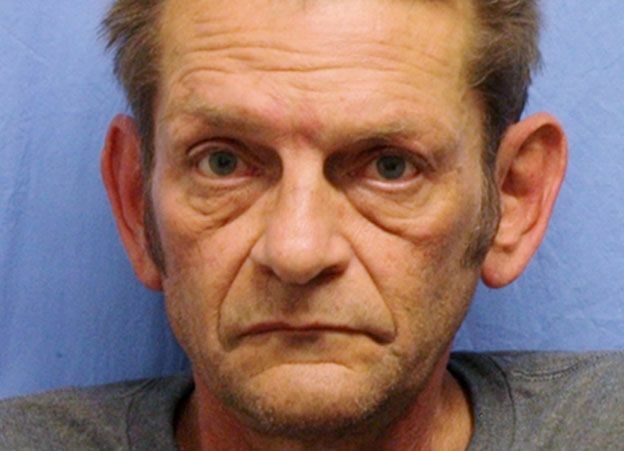 Police are investigating whether the fatal shooting of a man in the US state of Kansas was racially motivated. Three men were wounded in the shooting at a crowded bar in Olathe on Wednesday night and one of them later died. 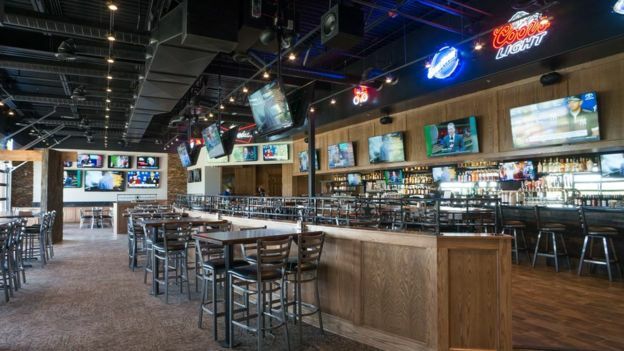 A barman told local media a man used racial slurs before opening fire. Two of the victims, including the deceased, are Indian. Adam Purinton, 51, has been charged with premeditated first-degree murder and the FBI is investigating a motive. 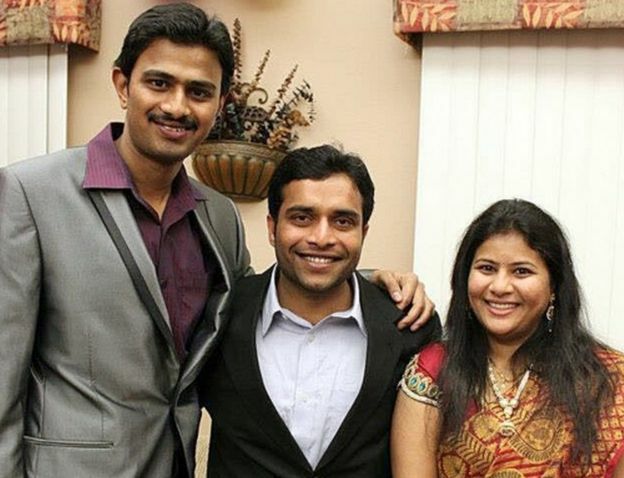 Srinivas Kuchibhotla, 32, died while his friend Alok Madasani, 32, remains in hospital in a stable condition. 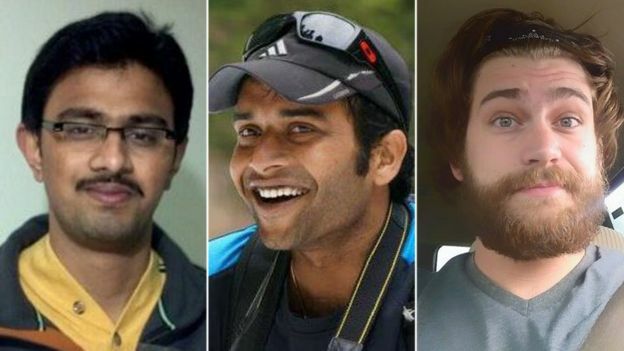 The two men were engineers at US technology company Garmin and studied in India, according to their social media profiles. The other injured man, Ian Grillot, 24, had apparently intervened to stop the violence, according to witnesses. Speaking from his hospital bed to local TV News channel KMBC, he brushed aside suggestions that he was a hero. "I was just doing what anyone should have done for another human being," he said. "It's not about where he's from or his ethnicity. "We're all humans. So I just felt I did what was naturally right to do." A bystander told the Kansas City Star that just before opening fire the gunman shouted: "Get out of my country." The suspect allegedly fled on foot and was arrested five hours later at an Applebee's restaurant just over the state border, 80 miles (130km) away in Clinton, Missouri. The Kansas City Star reported that he told a staff member at the dining chain he needed a place to hide because he had killed two Middle Eastern men. A barman there tipped off police that he had a customer who had admitted shooting two men and the officers arrived to detain the suspect. Olathe Police Chief Steve Menke declined to comment on the reports of racial abuse but said his force was working with the FBI "to investigate any and all aspects of this horrific crime". The killing dominated news bulletins in India and social media, where some blamed Donald Trump's presidency. Siddharth, an Indian actor who uses one name, tweeted to his 2.6 million followers: "Don't be shocked! Be angry! Trump is spreading hate. This is a hate crime! RIP #SrinivasKuchibhotla." Mr Madasani's father, Jaganmohan Reddy, also called it a hate crime, adding that such incidents had increased in number following Mr Trump's election. Mr Kuchibhotla was from the Indian city of Hyderabad. His parents, Madhusudhan Rao and Vardhini Rao, were too stunned by news of his death to comment, the Associated Press reported. The Indian external affairs ministry said two Indian consulate officials from Houston and Dallas have been sent to Kansas City to meet Mr Madasani and arrange the repatriation of Mr Kuchibhotla's body. The US Embassy in New Delhi decried the shooting. "The United States is a nation of immigrants and welcomes people from across the world to visit, work, study, and live," said Charge d'Affaires MaryKay Carlson. Last Wednesday evening in Olathe, Kansas, two Indian men in their early 30s met for a few post-work beers in Austins Bar. Both would be shot by a stranger that night in a suspected race hate crime, along with a 24-year-old American who attempted to intervene. 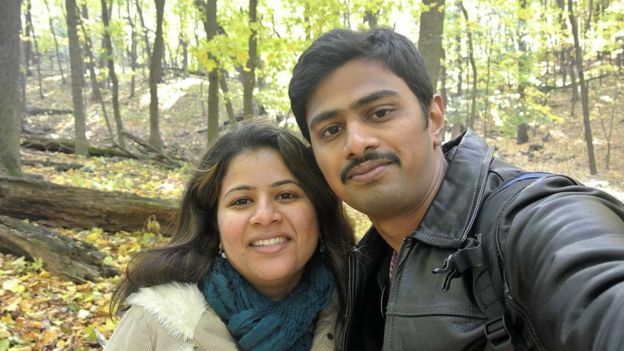 Engineer Srinivas Kuchibhotla, 32, died of his injuries. His friend Alok Madasani was hit in the leg - but survived. Mr Madasani told the BBC how the shocking attack unfolded as the two colleagues sat in the sun, chatting about films. The quiet beer that ended in tragedy:Olathe shooting survivor Alok Madasani tells the BBC his story"Srinivas and I had known each for almost nine years. During weekdays we tried to get a beer or two and chill after a long day's work. "On that day the weather was just so perfect that neither of us could do what we do regularly - which is work till seven o'clock and then go home. "We typically drink Jamieson's whiskey, but that day the weather was so nice we ordered Miller Lite beers. "We were talking in our language - Telugu. We were having a conversation about one of our friends at work who wanted to watch Bollywood movies... 'What movies do you think we should suggest?'. "This guy just randomly comes up and starts pointing fingers. We knew something was wrong, but there was a [basketball] game going on so it was very loud. "He came towards me and said, which country are you from? Are you here illegally? Olathe shooting: Who were the victims? "I went straight inside to get the manager, and I should have taken Srinivas inside with me as well. "These fellow Americans escorted him [the stranger] inside. All I heard was, 'This is not how you talk to guys like these - let's go.'" 'He's back with a gun'The two men then went back into the bar to order some fried pickles and two final beers. The TV was blaring as the basketball game continued. "I heard a pop. Next thing I know I was right on the ground. I dove for my life. I heard two to three go off again. He came from behind so I didn't even see what he was aiming at. "I'm not sure if when I was trying to get up is when I got hit, or when I was down. From that moment onwards, I tried to get up and I just couldn't. "I heard people yelling. I didn't pass out - I was trying to get up, and all I saw was Srinivas lying there motionless." "One guy, Brad - he removed his shirt and tied it to my leg. He saw that my jeans was filled with blood and he didn't know what to do. The best thing to do at that time ... he just took out his shirt and wrapped it around this leg so tight that I just couldn't do anything. He definitely saved my life. "The ambulances came, and when they put me on the stretcher, Srinivas was still there. "I was under the impression that his injury wasn't serious, so we could go home that night. I was telling the doctor to wrap it up, that we didn't want our significant others to know that we were in a shoot-out. 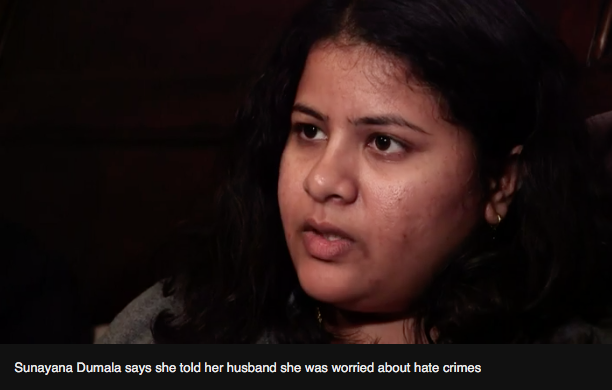 Fears over Facebook - then the police came to her door: Widow Sunayana Dumala tells the BBC how she learned of the tragedy"I will show you his last text message... You might not understand the language. I asked him, when will you come home? He said, 7-ish - why? "I said, is it because of work? - he stayed late on Tuesday night. - Can you come home and work? Let's have tea together! Time passed, and Srinivas failed to show up. Sunayana tried his phone, and when she couldn't reach him assumed that he had switched it off. "I messaged [Alok's wife] Ripti asking, is Alok home? She said no - one of their cricket friends met with some accident, and they're doing some stitches to the leg and it might be beyond midnight too. "Like a very stupid girl, I believed that. Then she messaged me again, asking the name of the bar they usually go. I said Austins, and I asked why? "I was having my dinner, and I have this habit of scrolling through Facebook, which he never used to like. Then I saw some video, some shooting, and I was like - has something happened again? Who is hurt? Then I see the name Austins. I started connecting why they asked. 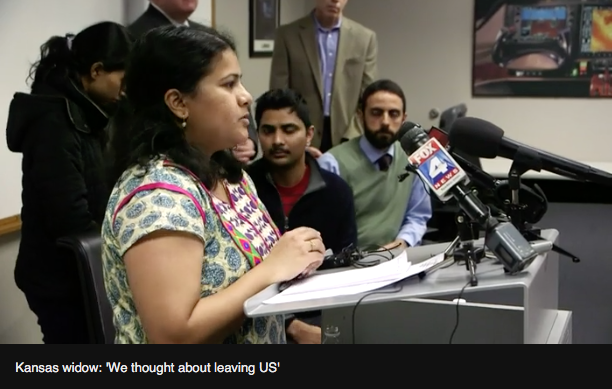 After reading that the shooting victims had been taken to University of Kansas hospital, Sunayana wanted to go there - but two police officers arrived at her home to tell her the worst had happened. "I went to the hospital. I had to go through a security check. It's a hospital policy. My husband is lying there dead, and they said I needed to go through a security check. They did not allow me inside. they said they needed to follow the procedures of autopsy and everything. "Detectives came. One FBI representative and one local cop. 'He is everywhere, whatever I do'"We came here with so many dreams. He personally wanted to do so much for this country. He studied here, he made so many friends. "I am so worried. I think hate crime will be more open now. Will it be safe for us to go to a mall? Will it be safe for us to go to the office? "Now I feel I have to show people here - you've taken away my love, but I'm here to spread love. "He is everywhere, whatever I do. His clothes are here, his side of the sink, the way he used to brush, shower. His daily prayers in that room. "He was a very loved child. His father's most trusted son for any kind of advice. He recently purchased a car for his dad. He was so happy and so proud about it. "There are three brothers. He's the youngest. Whenever they did something naughty their father would run behind them in the house. This one [Srinivas] used to be the fastest. After running three or four times my husband used to feel bad for his father. He used to stop and get the beatings for all three. That's how kind he was."